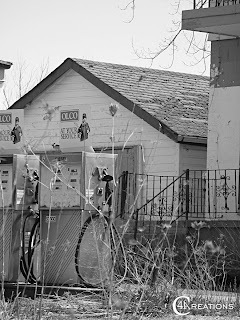 This week's edition of #TuesDecay (follow along on Google+ to see all the posts) features an abandoned gas station out on Hwy 3. It's a weird spot, since the pumps look as if they've been taken care of, complete with relatively new OLCO signs, but the lot itself is overgrown and the buildings look about ready to fall down. The contrast creates a very Twilight Zone feel. Creepy that the pumps were cared for, but not anything else. I wonder what's in those pumps?